When Brooke has to move to a new town to escape her father’s incarceration and her mother’s breakdown, she planned to stay invisible. The last thing she expects is to connect with the town’s most popular guy, hockey star Jake. But after saving Jake’s life in a hockey hazing incident gone wrong, she finds herself working with Jake. Neither could imagine the connection they find with each other, nor how it will change their lives. The romance. Oh, the romance. Be still my beating heart. As soon as I finished reading On Thin Ice I had to go back and read all my favourite bits (some, okay, a lot were kissing bits) again. Brooke and Jake’s connection and chemistry is absolutely captivating. Yet alongside this story of love, is a story of challenges and making big sacrifices to stand up against them. Brooke is dealing with a family breakdown that has thrown more challenges at her than she is sure she can bear. Her father is in prison, her mother a zombie, her own past decisions weigh on her, and moving to a new town away from her passions is daunting. Jake has waited all his life for his senior year, the year he can finally show what he has on the ice. But a hundred-year-old hazing ritual goes bad, leaving him doubting his place in the structure of the town’s history and love affair with hockey, one that is now costing him his future and almost cost another his life. But choosing to stand up against that hierarchy and history will have even further challenges and costs. Despite what Brooke and Jake face they are both there for each other. They make a fantastic team, supportive and understanding and this deeper layer makes them a fantastic couple, going so far beyond fantastic chemistry. I really loved On Thin Ice. It is by far the best book in this series and I enjoyed the first two books, as well. While each book can be read as a standalone, following this group of characters and the Juniper Falls icy hockey team has been wonderful and so much fun. 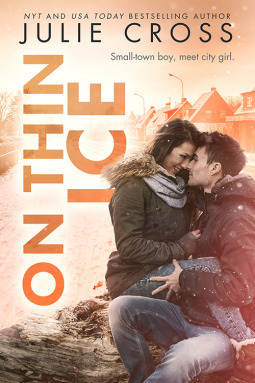 I highly recommend On Thin Ice to readers who love YA contemporary romance and sports books.